The first three units of the Malzoni GT were ordered by the Vemag Team with the clear purpose of competing in car races. Soon they were standing out on the race tracks. The success on the race tracks translated into an increased number of orders which demanded the creation of a structure that would enable the manufacturing of more cars and fulfill the demands of the market. The 1960´s, when the Malzoni GT was created, became famous as the golden years of the Brazilian auto racing. They were marked by a kind of rivalry that existed among the brands that had recently settled in the country. These brands included WILLYS (Renaults and Interlagos), SIMCA and FNM (JK and Alfa Romeo, besides DKW itself). 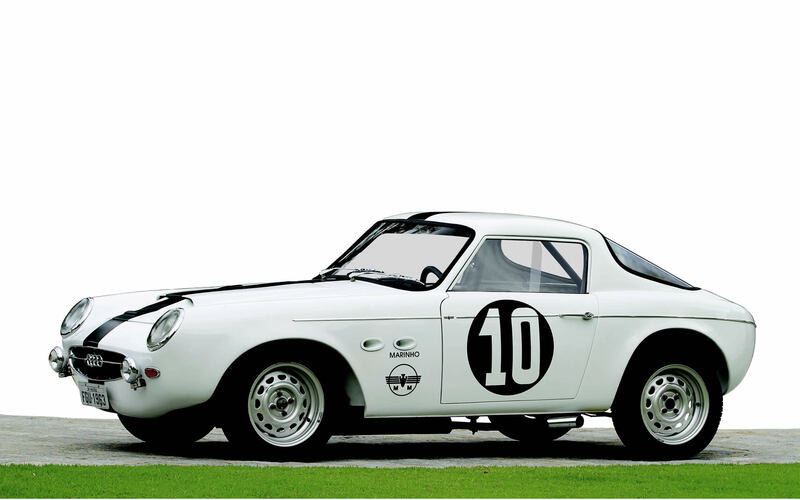 Unofficially, VW was also part of this competition with the Karmann-Ghia Porsche from the dealership Dacon. Among all of them, the Vemag Team stood out as the fiercest of all. The DKW had a front-wheel drive ,unusual in those days, which afforded it advantage on street courses and in the rain as well. However, the engines developed only 50CV as standard. Even if the team could eventually improve their engines to achieve more power, like 100CV for instance, the cars were heavy, which affected negatively their speed on straight tracks. Being lighter and with better aerodynamic lines, the Malzoni GT brought new perspectives for the team. Type II, with its steel body, was the turning point in the team´s history. On July 19, 1964, in the ABCAT Six Hour Race at Interlagos, São Paulo, Marinho came in fifth place. But, the car broke. On the following week, the Malzoni GT put on a show on the street course of Barra da Tijuca, in Rio de Janeiro, dueling with the powerful Karman-Ghia Porsche. However, once again, it did not complete the race. The Malzoni GT at turn 1 in Interlagos between a Karmann-Ghia Porsche Dacon and a Willys Berlineta. Above right: in preparation to begin the race, Rino talks with Marinho, observed by Crispim. The first podium would come in October at the GP Simón Bolivar, in Interlagos. Soon after, at the Guanabara 500 Kilometers, won by Wilson Fittipaldi Jr. in an Alpine 1300, the daring Malzoni arrived in third place, just before José Carlos Pacce and Vitório Andreatta, both in Willys’ cars. In March 1965, the first fiberglass Malzoni, 150kg lighter than the previous version, made its inauguration in Recife. In May, it raced in Rio de Janeiro and lost for two powerful imported Abarths from the Simca Team, a result that would happen once again on the following month in Interlagos, São Paulo. In September, at the 400 Years GP in Rio de Janeiro, it came in second place, after the Ferrari 250 GTO of Camilo Christófaro. The second victory took place on the streets of Piracicaba, São Paulo, when Marinho, Eduardo Schurachio and Francisco Lameirão left in their Malzonis behind the Dacon´s KG Porsche. The three white prototypes were defiant and defended their positions superbly. Although with engines less powerful than those of their competitors, they were right on their heels. Besides the drivers from São Paulo, Marinho, Francisco Lameirão, Eduardo Schurachio and Anísio Campos who raced for Vemag, there was Norman Casari from Rio de Janeiro who, driving a Malzoni, claimed his second state championship title in 1967. He celebrated his victory over competitors with cars like a Ferrari GTO, an Alfa GTA and a Dacon KG Porsche. Winners parading in the streets of Piracicaba on August 8, 1965: Marinho Camargo (#10) Eduardo Scuracchio (#9) and Chico Lameirão (#11). Another driver to be remembered is Henrique Iwers, from Rio Grande do Sul. He came in fifth place in 1968 in the Antoninho Burlamaqui Road Race. In that same year, he arrived in third at Porto Alegre´s 500 Kilometer, right behind Chico Landi and Jan Balder´s BMW, a car utterly superior, and competed until the very last lap against the legendary Vitório Andreatta´s Ford “Carretera”. The Malzonis from Vemag and independent drivers disputed at least 54 races, claiming fifteen victories, twelve second, and seven third places. The figures might be even greater once the records in those days were not very accurate. Some races were epic, like the GP Faria Lima in Interlagos which was disputed in three heats. Francisco “Chiquinho” Lameirão won the first one and came in second on the second heat. Both Lameirão and José Carlos Pace, driving a Dacon Karmann-Ghia Porsche, put on an unforgettable high performance show. Pace was faster on the straight sectors, but in the winding sectors, Lameirão would be right on his tail. During the third heat, a stone punctured the Malzoni’s radiator and the damage spun him off. Emerson and Balder’s car crossing the finish line of the 1966 Brazilian 1000 Miles. The young drivers finished in third place. Another legendary episode occurred in 1966 during the Brazilian One Thousand Miles. The Malzonis were dominating the race in great style with the youngsters Emerson Fittipaldi and Jan Balder coming in first, followed by Marinho and Schurachio. Running third, Camilo Christófaro and Eduardo Celidônio were driving the powerful Corvette Chevrolet with no less than a seven-liter engine. On the last refueling stop, the engine of the leading Malzoni stuck and rebuffed to restart. Balder and Fittipaldi lost precious time in the pits and dropped down to third place. Marinho, who had taken the wheel to finish the race, was then the leader, with the Corvette Chevrolet getting dangerously closer. The end of the race was movie-like: Celidônio overtook when entering the final straight, leaving Marinho no chance for reaction. As mentioned by the innumerous chronicles published then, the highlights of the race are unforgettable to those who were mere spectators and to those who participated.